When should I go for K-Means Clustering and when for Hierarchical Clustering ? Often people get confused, which one of the two i.e. K-Means Clustering, and Hierarchical Clustering, techniques should be used for performing a Cluster Analysis. Well, Answer is pretty simple, if your data is small then go for Hierarchical Clustering and if it is large then go for K-Means Clustering. Are you really interested in knowing background story ...? No. of Pairs = C , where n is number of observations. Now once the nearby observation make pair, the distances among newly formed pairs are calculated. Imagine the number of distances if n = 5, in first iteration, it would be 5! / ( 2! * 3!) = 10, which are manageable. And this is only first iteration. Despite in every iteration the number of distance reduce significantly, calculation of these many distances become quite un-manageable. Hence we switch to K-Means Clustering. Now Distance of each observation with each Centroid is calculated. So in first iteration, keeping number of observation 10,000 again, the number of distances calculated would be = 3 X 10000 = 30000. Now again Centroid would be calculated and then again the distances ( 30,000 again). So even after fair number of iterations, calculation of distances remains quite manageable. Then one would say, then we should use only K-Means ... well, I would say ... You can. 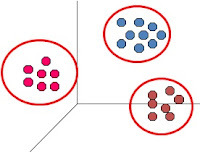 But in K-Means Clustering,we need to iterate the model to find out the optimal number of Clusters, but in Hierarchical Clustering, it automatically gives result at various number of Clusters. Time is money, so please make a habit to save it. Hence, use hierarchical Clustering for small dataset, and K-Means Clustering for large dataset.